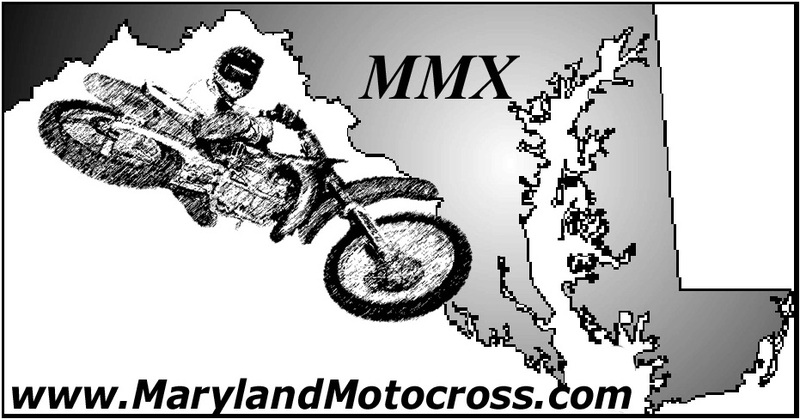 Maryland Motocross.com: Hi this is Scooter fro…..
MM.com: Why that little %$#*&. MM.com: When??? The first time or the second time? MM.com: Hi, It’s Scooter from MM.com, got time for an interview? JL: Ummmm, can you call me back in like 5 minutes, I’ll be home then. MM.com: Sure, I’ll call you in 10. JL: Hi, can I speak to Scooter please? MM.com: Yeah, this is him. Ready for that interview? JL: Yeah. Sorry about yesterday; went back out riding. MM.com: No problem Hey Jason, umm you got me good with your voicemail, (JL laughs hard) and I figured it out after the 46th time (JL laughs even harder) , so could you ignore the dozens of death threats and bad names that I called you on those 40-odd messages I left. MM.com: Yeee-ah. So, you going to the Winter Olympics? JL: Uh, yeah, we’re leaving tomorrow morning or tomorrow night, I’m not sure. MM.com: You trying to get used to the weather before the race? JL: Yeah, I should have a couple days before the race to get used to it. All of my bikes are pretty much done. Just gonna go down there and make sure that everything is perfect. 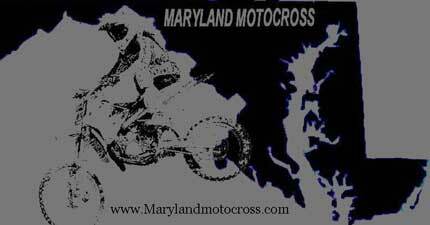 MM.com: You recently had a crash at Englishtown, is that correct? JL: (Laugh) I had 3 really bad crash's at Englishtown. In practice, right before the finish, on that long straight, I lost my focus, got sideways and went over the burm. 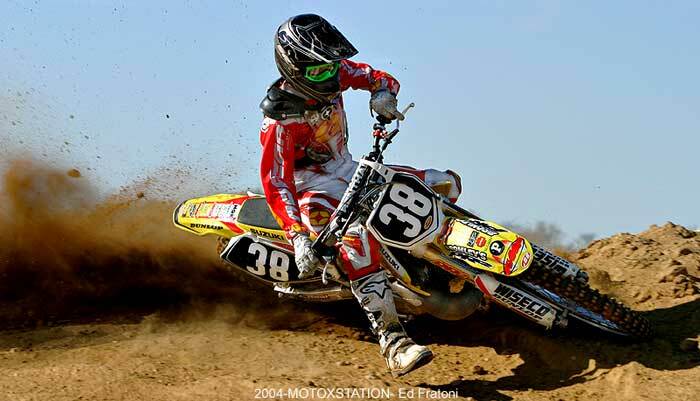 Then, I was leading Collegeboy in the first motto, went over a Psycho Double and hit a kicker right after it, crashed there pretty bad, and then I was right behind (Matt) Boni in 250 B and I tried to go around him on the outside, hit a pretty big hole, and crashed there too. They were all pretty bad, but I still won the plaque on Sunday. MM.com: All the kids here in Maryland want to know what your favorite cereal is? JL: (Pause, laugh) That would definitely be Fruity Pebbles. JL: Ohhhhh! He’s the man. JL: He’s the craziest. He’s outta control. MM.com: I know you attended the Outlaw Race at Blue Diamond, how did that go? JL: I uh, had to ride the B class, wasn’t allowed to ride the A. I caught up with all the A guys from a staggered start. It was pretty good, pretty nice, would have been great if I could have rode A, but I guess it’s something you’re not allowed to do. MM.com: Wow, you don’t sound bitter. JL: (Hard Laugh) No, not at all. Hey, rules are rules. You can’t be happy when they work for ya and mad when they don’t. MM.com: Collegeboy, so you’re at least 18, right? JL: Me? No I’m 17. MM.com: Oh, okay. So when did you start riding? JL: Like when I was about 2. Started riding out back, on a little track. Kinda been riding there since. I ride as much as I can. It’s hard work. MM.com: What kind of gear do you use and what type of bike do you ride? JL: I wear No Fear and I ride Suzuki. MM.com: Do you wear No Fear off the track as well? MM.com: Sweet! So who would you say is your biggest competition out there now? JL: Umm, probably Ryan Villopoto. He moved up to B class, hes pretty good. It’s gonna be good to race him at Mini-Os and see how he’s doin’. MM.com: All right. We saw you at Blue Diamond with your son, are you training him to be a rider too? MM.com: Kevin Asked you if he was your son and you said he was. JL: Nooo Waaaaay. He’s my little brother (laugh). MM.com: Oh, is he into riding too? JL: (Laughing still). Yeah. He rides a little bit. Rides a 60. MM.com: Okay. What would be your favorite track and your favorite event to attend? JL: Both would be Loretta’s. The track’s great and I like the overall feeling of being there. MM.com: Is it hard to ride there? JL: Ummm. If you go into it prepared, it’s kinda like it’s just another track. There’s a lot of hype, but everyone should treat it like it’s just another track. MM.com: What was it like winning the number # 1 plate there? JL: It’s good. I felt pretty good about going into it with those two classes. I was prepared, so the races turned out to be kinda easy. MM.com: Ohhhhhkay. 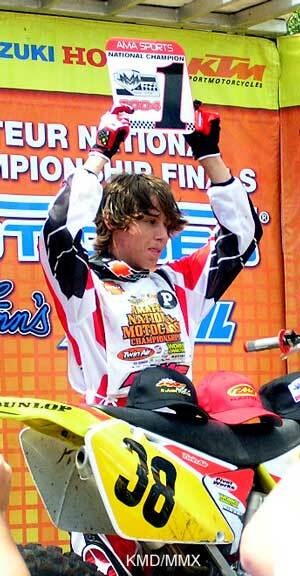 To some people you have a Bad Boy image in Motocross, how do you feel about that? JL: (Laugh) It doesn’t really affect me at all; whatever people think. I mean, you’re not going to be able to change what they think, so it doesn’t really affect anything. MM.com: Who would your thank list include? 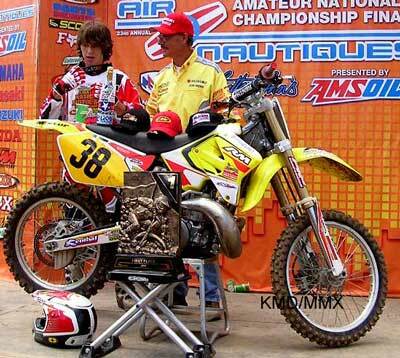 MM.com: If you had the power to change anything in motocross. Anything, for one day, what would you change? JL: Aww man, I’d make the C class more fair. It’s kinda crazy watching how fast the kids in the C class are. I’d make the advancement more fair. MM.com: Would you give yourself more money? JL: (Laugh) Ummm. A little bit (laugh). MM.com: How do you think you’d do in a race against Captain M? JL: I have no idea who that is. MM.com: Travis knows who he is. JL: Who the heck is Captain M? MM.com: I don’t think I should be telling you if you don’t “Recognize the skillz” You’d better ask around. JL: (Laughing) Must not be too fast if I don’t know who he is. MM.com: Uh-huh. 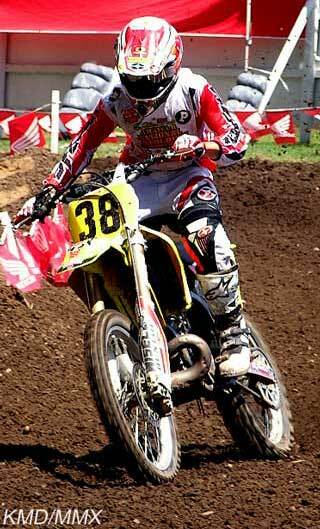 How do you feel about women racing in motocross? JL: I think it’s good. I don’t really watch them or anything, but I guess I could. MM.com: How would you feel if one beat you? JL: It would probably, (pause) probably be the end of my career. MM.com: Got anything to say to those West Coast Lodies that say West Coast Riders Rule, or that Jason Lawrence looks like Sid from “Toy Story”? JL: I don’t know about that man, but the East Coast is far better. MM.com: All right Jason, thanks for you time and good luck at the Winter Olympics.